And the same can be said of men’s clothing; at least the clothes that concern me. The civilized sort, the tailored sort, the dandiacal sort that make both men and women gaze on with admiration. In the last decade, Western men have experienced the sort of social pressure and tests that would normally take a century. Out of the almost victorious jaws of Casual Friday and, indeed, what seemed like the end of this garment once and for all, the suit has resurrected itself, phoenix like, via its own versatility of design. The Founders would be proud. Initially, this versatility gave rise to the uni-purpose black suit (which is making a comeback!) and orphaned suit jacket paired with jeans. Subsequently, Millennials adopted the suit as a symbol of both personal expression and self reliance in a time where every institution fails them. In fact in recent memory, there seem to have never been so many suits worn in New York City in a very long time. Additionally, bow ties are also seen everywhere. One might ask, is this a sign of the sartorial apocalypse? I think not, rather more of a counterrevolution for tailored clothing against the sans culottes of urban gear. Why is this suit renaissance taking place? Men as hierarchical figures have been rocked to their foundations by the recent global fiscal traumas. Additionally, there are parallels between this time and Beau Brummell’s where everything is called into question including a man’s self-worth. A Millenial might well ask, how can a man demonstrate high value today? Indeed, there seems a renewed interest in those finer touchstones of wit, manners and good form. It smacks of Regency England when to be a gentleman was the ne plus ultra of male inspiration. Brummell’s time was a reaction to the confusing social upsets caused by The French Revolution which rendered heredity and noble titles less important than style and grace. Similarly, In this post Bear Sterns and Lehman Brothers world where toxic debt, governmental austerity and rampant unemployment continue to dog our global markets while both terrorism and monthly national revolutions make paranoia and insecurity our daily companions, it is no wonder that we search for visual, tangible signs of strength and success. But, what sort of hero can save us from those suffocating monsters created by the relentless fracking of our new millennium? Enter the dandy. When a man’s worth seems to be how he presents himself, the dandy returns to demand the best from both form and function. Never before have looks been more important for men; especially young men. Now that there is this newly awakened desire amongst men to look good, to appear well groomed, prosperous and refined what are the dimensions of that look and where can they be found? Bad taste can be summarized as what everyone else wears. Good taste is of course what I wear and what I suggest you should wear. 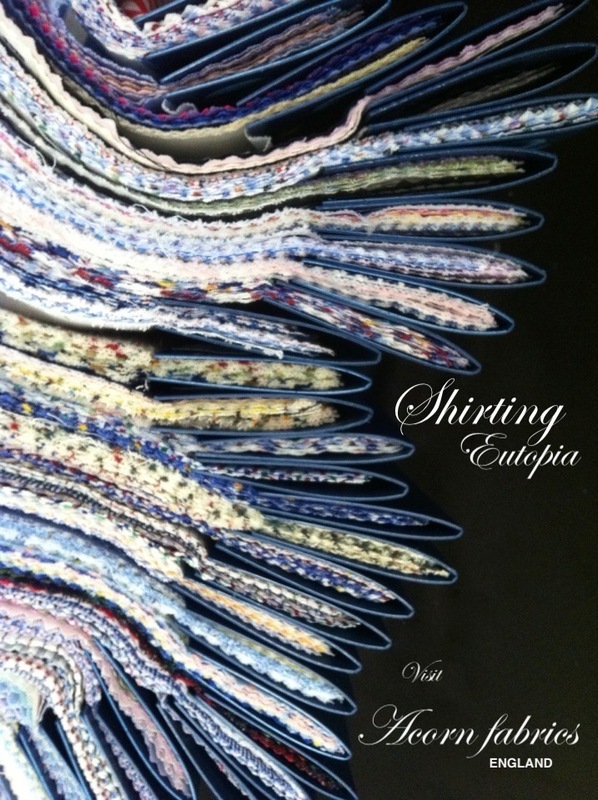 Good taste dictates that colors, patterns and textures for shirt fabrics are executed in a manner that suggests the wearer is the best sort of person. And how does a man identify that sort of fabric if he is not “To the manor born”? He saves time and energy by buying from a company which has already captured gentlemanly lightning in a bottle. That’s why I like Acorn fabrics for shirts. Indeed, shirts are very central to your look. A man should acquire suits and jackets that form a personal color palette but there probably should be some limitation to the range of colors he chooses from. 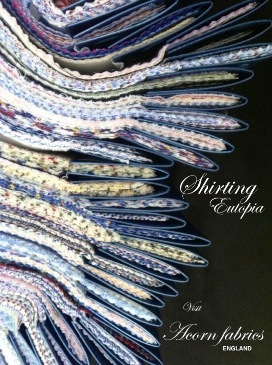 Shirts, however, can be a great deal more varied and can drastically influence the mood of a given outfit. From Brummell onward the English have set the tone for what gentlemanly comportment should be for a man’s shirt when worn with a dark suit. Generally but with some exceptions, shirts should be pale in tone. Additionally, a man’s shirt is not only pale but also limited to certain colors, primarily blue, white, and pink or some combination of these shades. Other colors such as purple, red, brown, green, orange and yellow do play a part in shirts, however it is crucial to control yarn shade and more carefully integrate the color into a design in a manner which the colors pink, white and blue are not nearly as subject to. But why should English shirt taste be the guiding light for men who have never been to England? The English concern with uniforms, with propriety and with male dignity has rendered their shirt tastes the best in a world where men currently strive to present themselves competent, engaging and refined. Acorn Fabrics make top quality goods and they apply just the right amount of finish; to be sure, a very small amount of finish. The English like a matte look to their tailored wools and expect their shirts to complement that look. 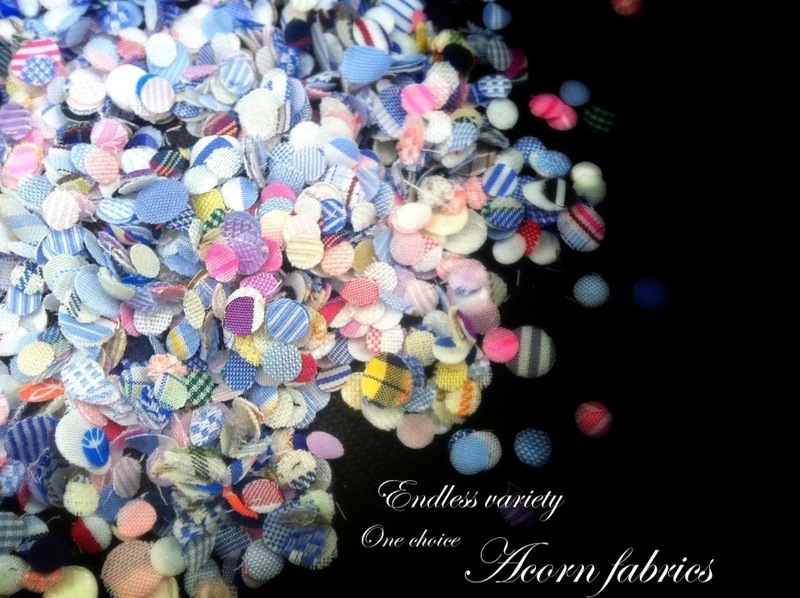 Acorn’s fabrics are robust and hard wearing but always feel soft and pampering against the skin. Acorn puts a lot of thought and energy into what they receive from the last few English weaving mills. They make a relieving variety of fabric types for the demanding variety of affairs a gentleman might find on his schedule. Acorns yarn colors and textures are always correct for the best and most important type of men. Everything a man could need for business, for casual, for summer and for winter. There is not a single fabric pattern or color that a serious man cannot use for some part of his wardrobe. In their English restraint, one would be hard pressed to find an Acorn fabric that does not look well with a tie. They have formal fabrics like voile and pique for wear with black tie. Additionally, many of their fabrics have multiple uses. For instance, their tartans can make a preppy button down, a short sleeved shirt or a pleated tuxedo shirt. Acorn cover the basics such a solids, and simple patterns well but also provide enough pattern variety and color interest to keep shirt choices fun. Renowned for their Grassmere range of superfine 160s 2×2 ply which are cool and silky next to the skin, their Cambridge and Bamboo ranges are also amazing for summer wear. Their new Burneside 300 range is silky enough to wear with a suit and beefy enough to wear with a sports jacket. The Hampton range of plaids is well designed and contemporary, and yet also seem like classics. It is amazing that the firm could produce so many conservative fabrics that also double for designer inspirations or current gentlemanly vogue, such as their white on white cottons. Today’s white business shirt is often anything but plainly smooth in texture and Acorn offers many types of pique weave and jacquard pattern as well as a royal pinpoint 100s 2×2. Their prince 120s 2×2 ply twill doesn’t seem to the naked eye like anything extraordinary but it is heaven to wear. My only complaint about Acorn is that their ranges are often too small and could literally be either doubled or tripled in selection. They also have a tendency to retire popular or unique patterns rater quickly. How we go about producing what we do. Firstly, we’ve got to like it! I know this sounds simple, but if I really don’t like it – I can’t get behind it. I may not always be right and that’s why I ask not only Dad and James but also I ask advice from yourself and also from my staff. At the end of the day, though, I give the “yay” or “nay”. We do also look at our customer base and try to design a collection that appeals to our desired end-user. It is crucial that what we design can actually be made by our mills. I’ve seen thousands of designs over the years that looked fantastic but were not possible for us to re-produce. This may have been due to yarn colour availability or simply limitations in the looms that we work on. When designing, I have always got the strengths of the various mills that we use, firmly at the front of my mind. Is time consuming. By contrast, working with stock colours means that generally they are ready to use and that I know how they will look which makes designing patterns more successful. From time to time, yarn colours become discontinued and we have to create a new stock colour – this can lead to creating some fabrics where the colour of the finished fabric is not quite right. This also means that we have gradually developed a range of “house” colours that we use in our ranges, such as AP butcher, red, black, coral, purple, sky. It is also the reason why in some ranges, pink is absent because the pink dyed did not produce a perfect colour but one with an unwanted hue. Popular ranges tend to lend themselves to expansion, while slowly selling ranges often prompt scrutiny which often leads to a redevelopment of the range. Oxford, for example, is selling well and its yarns are readily available in an array of colours, thus I can create designs without too many limiting factors. Width has to be considered. Minimums in the wider width are reducing whilst it is becoming increasingly difficult to weave small runs in the narrow width. Last but not least is fashion. Although we are not cutting edge, more classic – we have to be aware of trends because a diluted version does filter down from the catwalks to our customers; usually several seasons behind. Further, Designers of all sorts love the quality of our products and buy some of our fabrics by the roll to showcase their season offerings. As we can observe above, there are thousands of designs they could produce but do not both because of the limitations of the English mills and because those designs are not for the English gentleman. Thus are traditions preserved with both belt AND suspenders. Every other shirt cloth merchant is coming up with the latest and greatest in design While Acorn is preserving the soul of what it is to present the gentlemanly ideal. One comment, or rather observation I have come to realize about style for men. Men want to look like gentlemen when they dress up and many also want to be unique. I see men dressed all over NYC in shirt patterns where they seemingly attempted to wear a shirt no one else has. Usually the shirt is a catastrophe because just being different doesn’t ensure its aesthetic success. Although occasionally a unique shirt can work, to be too unique can be as odd as dressing too generically. In the case of a purely unique shirt, one runs the risk of looking like an oddball or a bargain basement denizen. In the case of always wearing a very commonly chosen shirt one runs the risk of not being noticeable at all, rather like a shadowy, faceless clerk. It is more advisable to be part of a certain tribe of well dressed, well heeled, talented men. It’s quite hard to write about what visually makes a gentleman’s clothes but I have always known it when I see it and Acorn’s shirt fabrics express that look better than I ever could.